On Feb. 21 we reached the northern limit of our cruise at the seamount named Peleg after dredging Mystic and Morgan to the south. We then turned to the southwest where we dredged and mapped five more seamounts: Bildad, Narwhal, Bottlenose, Elijah and Bulkington. A few hours ago we dredged across a fracture zone that has cut a seamount in half, exposing its inner working for us to plunder. The relief between the seamount and the abyssal plain to the north is magnificent. You can get an idea by comparing it to the Grand Canyon where you have ~1.5 km of relief over a short distant. Here we are dredging from a depth of ~4.5 km to a depth of ~2.5 km over a couple of kilometers. 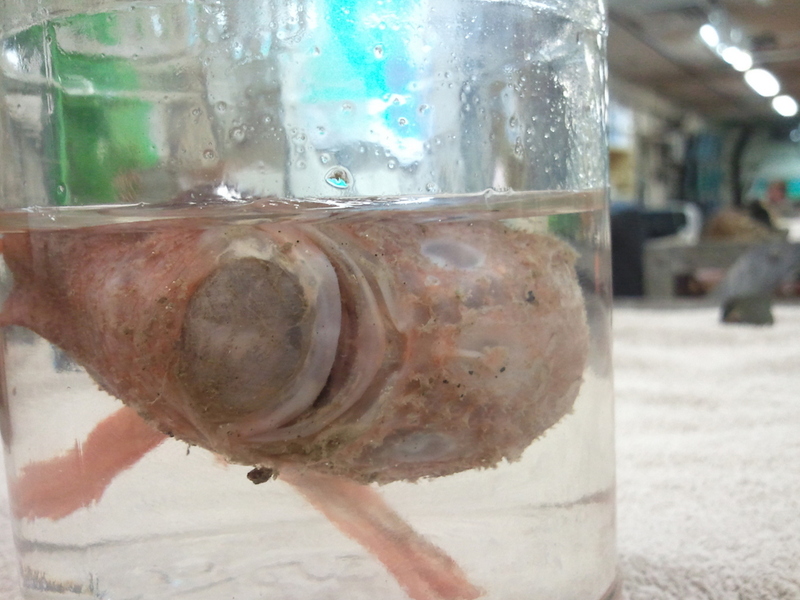 From this dredge we recovered an anglerfish (we named him or her Jerome) along with a few great pieces of basalt. Dredging along the fracture zone has proven to be very fruitful. Last night (2/25) during a third dredge on a fracture zone scarp we dredged up a variety of rock types. Previous dredges were composed of mostly pillow basalts and lava flows that were aphanitic (fine grained or <0.1 mm) and aphyric (no large phenocrysts in a groundmass of finer crystalline material). 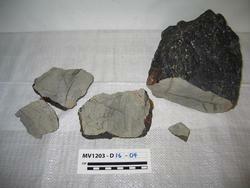 The basalts we have dredged up along the fracture zones are phaneritic (coarser grained or ~0.5 –1 mm) with no vesicles. We think that these are magmas weren’t erupted but stored within the seamount’s edifice in sills or dikes. There the magma would have been allowed to cool over a longer period of time, which allows for the crystals to grow larger. Pictured below is a large chunk of basalt that was recovered (about the size of a good pot roast) from Dredge MV1203-D16 (rock #4).